PYONGYANG: Thousands of North Korean troops followed by artillery and tanks paraded through Pyongyang Sunday as the nuclear-armed country celebrated its 70th birthday, but it refrained from displaying the intercontinental ballistic missiles (ICBMs) that have seen it hit with sanctions, reports AFP. Such set-piece dates are a mainstay of the North’s political calendar, and have for years been opportunities to demonstrate progress in its quest for a missile capable of delivering a nuclear warhead to the United States. But too militaristic a display this time might have risked upsetting the recent diplomatic dalliance on the peninsula, after Kim’s Singapore meeting with US President Donald Trump in June and his third summit with the South’s President Moon Jae-in due in Pyongyang later this month. After a 21-gun salute, dozens of infantry units marched through Kim Il Sung Square, some in night-vision goggles or wielding rocket-propelled grenade launchers, as the current leader—the founder’s grandson—looked on from a rostrum. Li Zhanshu, one of the seven members of the Chinese Communist party’s Politburo Standing Committee, the country’s most powerful body, sat next to him, the two of them occasionally exchanging comments. Armoured personnel carriers, multiple rocket launchers and tanks followed, with biplanes flying overhead in a ‘70’ formation. At one point jets trailing red, white and blue smoke—the colours of the North Korean flag—roared above the Juche Tower, the stone monument to Kim Il Sung’s political philosophy. 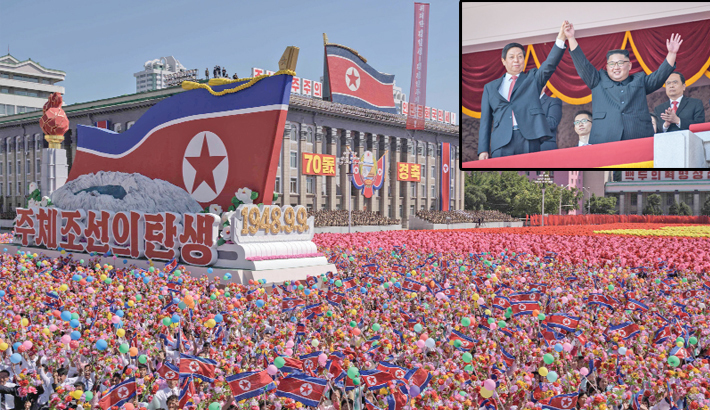 And immediately after the parade thousands of citizens rallied through the square, alongside floats displaying economic themes and calls for Korean reunification—the peninsula has remained split since the 1950-53 Korean War ended in an armistice rather than a peace treaty. Diplomatic invitations for the anniversary went out around the world, but the only head of state who attended was Mauritanian president Mohamed Ould Abdel Aziz—although AFP spotted French actor Gerard Depardieu seated in a section below the main tribune. Afterwards Kim and Li saluted the cheering crowd, the North Korean raising his guest’s hand into the air. Beijing is its neighbour’s key diplomatic protector and trade partner, and after years in the deep freeze over the North’s weapons ambitions ties have warmed rapidly this year, with Kim visiting China three times to meet President Xi Jinping. Speculation that Xi might reciprocate for the anniversary did not come to pass—Hu Jintao remains the last Chinese president to visit in 2005 -- but O’Carroll said Pyongyang appeared to want to promote its friendship with Beijing. “China is still a very important player and its presence here with such a high level delegation is intended in some way to remind the US of that,” he said. Washington is seeking the “final, fully verified denuclearisation of North Korea”, while Pyongyang has only publicly affirmed its commitment to working towards the denuclearisation of the Korean peninsula, a euphemism open to interpretation on both sides. The process has become bogged down in recent weeks, with the North demanding a formal declaration that the Korean War is over, and the South’s Moon caught between his neighbour and his ally. “Apparently Kim Jong Un thought that now was not time to unnecessarily provoke Trump,” said Kim Yong-hyun, professor of North Korean studies at Dongguk University in Seoul.